Kolymbia (Kolympia) Kolymbia (or Kolympia) is an organized, mostly sandy beach, but by no means as crowded as the neighbouring beach of Faliraki. The hotels in the area are mostly preferred by elderly visitors and families, so the atmosphere in the entire area is somewhat relaxed. Rhodes, in the Dodecanese island chain located just off the coast of Turkey, is an island that is rich in history, covered with large swathes of parkland, forest, unique natural beauty, inexhaustible archaeological wealth and broad beaches that cater to all different tastes. It is the fourth largest island in the Aegean with fantastic connections to all other islands and the mainland. 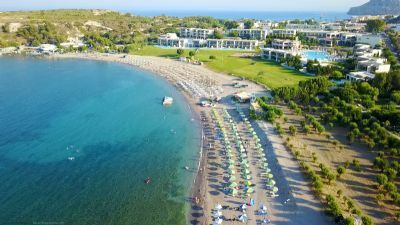 On Rhodes there is a huge variety of accommodation to choose from, to suite everyone from backpackers doing the European trail, to luxury seekers wanting something a bit more decadent. Even in the smallest towns of Rhodes you won’t have trouble finding a little local taverna. In fact, some of the best food on the island can be had in these little family run places. Rhodes has been blessed with many, wonderful, long stretches of beach. The island boasts long beaches developed for tourism, but you can also find many small sandy coves, almost hidden. Whether you are looking for watersports, family friendly beaches you will not be dissapointed. Rhodes island offers ideal opportunity to explore the local life and discover the beauty of the island! Rhodes is home to some unique and beautiful flora and fauna, much of which can be found just a short stroll from the main resorts but to get a true taste of what the island has to offer, exploring the interior is a must. The first traces of life on the island of Rodos are lost in the fog of myth. The first inhabitants are said to have been the aborigines Heliaden, agreements of the protective god Helios and the Telchines, a strange kind of people who supposedly resembled demons. Some of he most beautiful sites of Rhodes are hidden in the mountain villages, far from the cosmopolitan settlements along the shore. Many of them preserve the native color of the Rhodian countryside with old castles, churches and beautiful buildings.